The stopwatch is a display that can be turned on or off from the start menu. Press START to enter the start menu. Scroll to DISPLAYS with LIGHT and press NEXT. Scroll to Stopwatch with LIGHT and press NEXT. When activated, the timer can be accessed by pressing NEXT until the timer appears. The stopwatch is not visible while recording an activity. In the activated stopwatch display, press START to start measuring time. 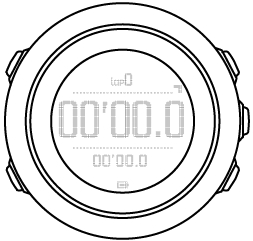 Press BACK LAP to make a lap, or press START to pause the stopwatch. To view the lap times, press BACK LAP when the stopwatch is paused. To reset the time, keep START pressed when the stopwatch is paused. switch to Time display with NEXT. If you no longer want to see the stopwatch display, deactivate the stopwatch. Scroll to End stopwatch with LIGHT and press NEXT.